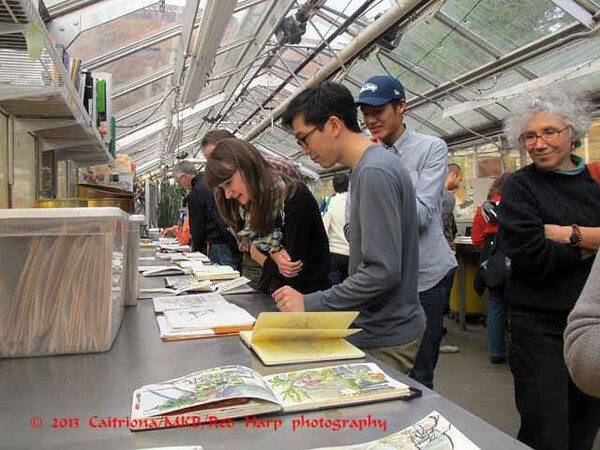 As others have already written, we spent our monthly sketch outing at the University of Washington Botany Greenhouse. 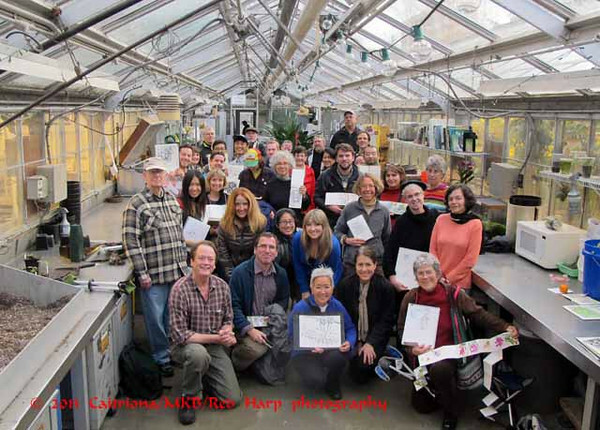 Doug Ewing, the manager of the greenhouse, was a wonderful host. He happily gave lots of information about any plant about which we asked. The details below are based on his "lectures". I wanted to include some of the greenhouse inftrastructure. Here is a jar of female seeds for the huge Welwitschia mirabilis. Doug said water got in the jar and he's drying it out on the duct. 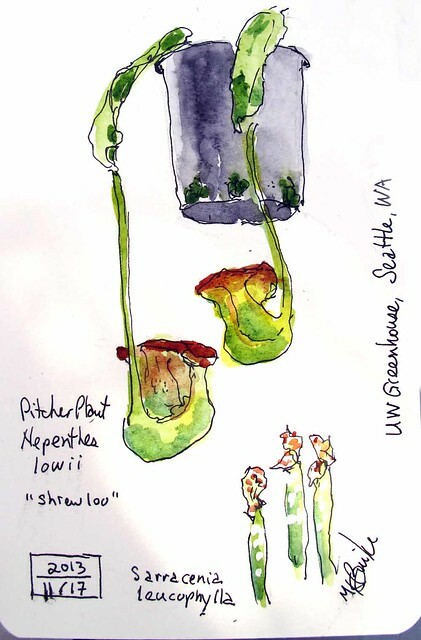 Then I sketched some carnivorous plants. 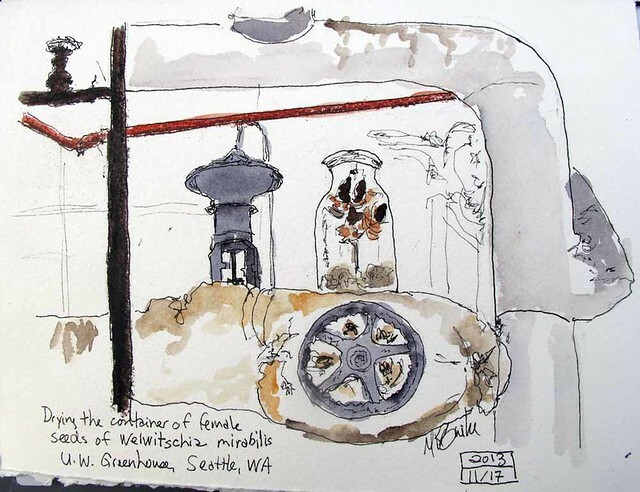 The "Shrew Loo" has a story. It has evolved a symbiotic relationship with a shrew. See this article and it's accompanying photo which describes how the shrew eliminates into the large opening of the plant. 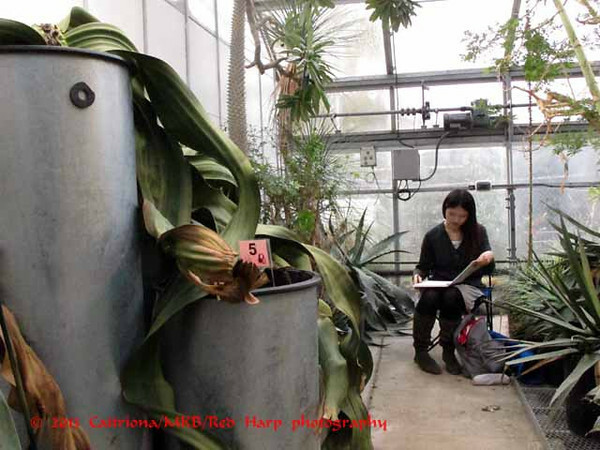 According to Doug, the plant doesn't catch bugs like other carnivores, it converts the "poo" into nitrogen. It also produces a sap which the shrew finds very tasty. So it attracts and feeds it's own source of food. The sap contains a fast acting laxative! Thus the plant is assured of nutrition while it feeds the shrew. Our host, Doug, is kneeling in front on the left.